Aksharadhool: Sitting on a $5.3 Million treasure without knowing it! Sitting on a $5.3 Million treasure without knowing it! Faustino Asensio Lopez is a Spanish farmer, who lives in the province of Ciudad Real in Spain. Sometime back in 1980 he was tending to livestock with his father in a field near Ciudad Real town, which is the capital of the province with the same name. On one day, during his daily outings, his eyes fell on a small outcrop of a nice looking rock deeply buried under the soil. He thought that its would be a useful thing for curing the meat and dug it out. The rock turned out to be a compact rock having dimensions of about 18 inches x 12.5 inches x 8 inches but was extremely heavy, Its weight turned out to be around 100 Kg. It was obvious that rock contained lots of metal, mostly iron and had remained safe because it was deeply buried inside earth. Faustino brought the rock home, Believing it to be military scrap from the country's civil war. The rock sat on the patio of Lopez household for more than three decades. Because of its heavy weight, it was used by family members to cure meat, in particular for pressing ham, and was soon forgotten. 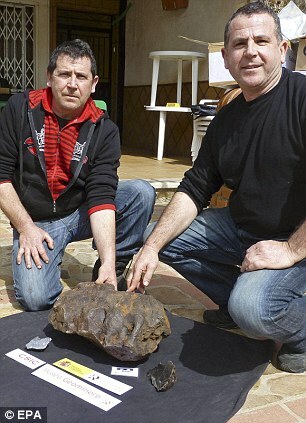 In the year 2011, Lopez saw a TV report on meteorite sightings over Spain and he suddenly remembered the rock, which he had found way back in 1980. He got in touch with geologist Juan Carlos Gutierrez Marco, who examined the rock. A small fragment was broken off from the rock and was sent for testing. Lopez had a shock of his life time when geologist Juan Carlos Gutierrez Marco called him and told him that the report has come. And it has been found after extensive analysis, that the rock was confirmed to be a pre-historic metallic meteorite, a solid piece of debris from an asteroid or comet that survived an impact with the Earth's surface. The estimated price for this one: cool $5.3 Million. To find a solid piece of an iron asteroid is something very rare. Spanish newspaper ABC says that only three such meteorites have been previously found in Spain so far, near Quesa, in 1898, near Granada in 1912 and near Zaragoza in 1950. The first results of the research on the meteorite are being published in the Journal Geological Survey, although the International Society for Meteoritics and Planetary Science has allocated this meteorite the official name of the Bullaque Retuerta, depending on the location of discovery . 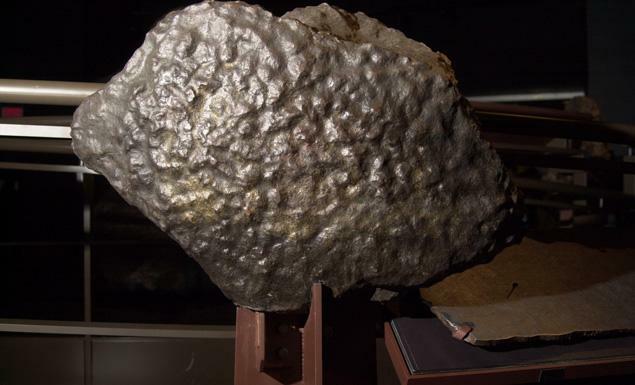 Spanish news agency EFE has reported that Lopez, who officially owns the meteorite with his brother Ramon, is thinking the possibility of putting up the meteorite for sale. The siblings said that they they have realised that there is a worldwide market for meteorites and that an offer could be made online to them. They would like it to be 'sold quietly' provided they receive 'a tempting offer' that meets their expectations. Meanwhile they have moved the rock to a safe location. 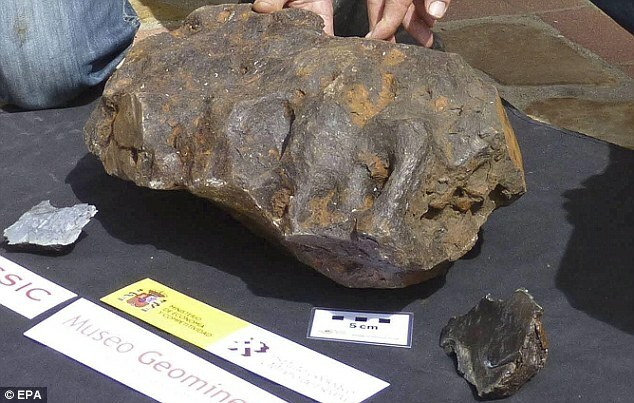 Madrid’s Mining Museum is now displaying the fragment broken off for testing, alongside a replica of the original in similar fashion to the Gibeon Meteorite found in 1836 in Namibia being displayed at the The Arthur Ross Hall of Meteorites in US. Lopez siblings have been Millionaires for all this time. Only thing that, they never knew it.